We worship on the First Sunday in Lent at 8 and 10 a.m., when we’ll experience Jesus Christ’s searing moments of earthly temptation and be reminded how he was nurtured by his profound understanding of Holy Scripture. Among many other things, our LORD was the greatest Bible scholar who ever lived. The Saturday evening service resumes next Sunday, March 11. The Wednesday noon service remains on hiatus. We also gather this Sunday (March 5) for the first installment of our three-week A Lenten Search for God at the Movies. 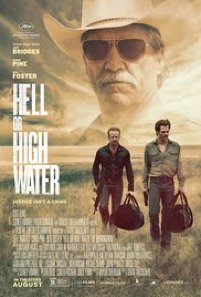 Pam Kelley and I will lead a discussion of “Hell Or High Water,” starring Chris Pine as a father who goes to deadly extremes to provide a better life for his children and Jeff Bridges as a Texas Ranger who helps hunt him down. Next Sunday (March 12), Linda Allport will lead a discussion of 2011’s “The Tree of Life.” Andy Guilford will be up on March 19 with a conversation about the critically acclaimed new Martin Scorsese film, “Silence.” “Silence” is still in some theaters, while “Hell Or High Water” and “The Tree Of Life” are available on various streaming services. Linda has also left a DVD copy of “Tree” in the church office if someone wants to borrow it. A great way to deepen your Lenten observance is to take part in the Lenten Quiet Day. Beginning at 2 p.m. next Saturday, March 11, and ending in time for you to attend the community Holy Eucharist service at 5 p.m., will be an afternoon for Lenten reflection; you can drop by for any part of the afternoon. We offer optional yoga at 2 p.m., an optional short prayer service and Lectio Divina scripture meditation at 3 p.m., and the opportunity for self-guided meditation or a labyrinth walk anytime during the three hours. Sign up is required for the yoga portion only. Please see the signup sheet on the counter in the narthex. For questions, contact Linda Allport at (949) 858-5354 or lsallport@cox.net. The first Rancho Santa Margarita food pantry distribution of the month is this Tuesday, March 7 at The Bridge Church, 30162 Tomas Ave. We need food donations and volunteers. Questions? Please contact Roger Bradshaw at parisbradshaws@me.com or (949) 505-4663. Kindly bring your donations to church this weekend or to the church office by Monday. P.S. : I spent the morning at the Diocese of Los Angele’s weekly food distribution at the Cathedral Center in Echo Park, where Laundry Love’s Steve Bruce (shown at right; Steve is also known as the spouse of the Rt. Rev. Diane Jardine Bruce) was volunteering today. 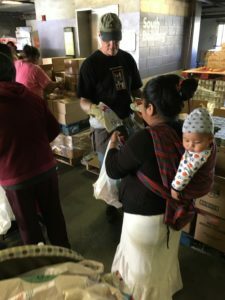 The food pantry, which serves up to 800 people each week, is the 16-year ministry of former LAUSD trustee Francisco Torrero (the Roger Bradshaw of the LA Diocese) and his fellow volunteers.